Increase grazing potential for cattle and profitable hay production. Maximize crop production while helping improve the soil. How to convert from commercial product to organic fertilizer. Produce good quality forage for horses with as little chemicals as possible with the ability for horses to stay on pasture after application. How to compare to 300lbs per acre of 18-18-18 on hay ground. 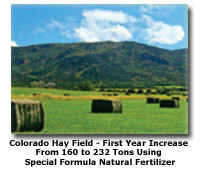 Achieve maximum yield of hay on 20 acres and turn mediocre pasture into green. Your information is strictly confidential and will not be shared with anyone. Fertilizer and sprayer cost $1,200 compared to $6,000 for the chemical fertilizer alone. Pastures were ready to be grazed again after 30 days instead of 90 days. Cattle used only 12 Magnesium blocks instead of 50 in previous years. Excellent results using All Natural Liquid Organic Fertilizer 4-3-3 even after severe drought the crop recovered and a high quality 3rd cutting was harvested. Mixed grass-legume production as it relates to permanent cultures on acid clay soils in the eastern U.S. and Pacific Northwest has special fertility requirements. These soils tend to contain high to excessive amounts of magnesium (Mg) and low to deficient amounts of calcium (Ca). The percentages of Mg and Ca must be adjusted to increase soil aeration allowing higher levels of biological activity to increase and sustain high productivity levels (the biology follows the chemistry). In general, one ton of gypsum and one ton of high Ca lime applied per acre during field renovation increase aeration and improve drainage on clay soils for several years. After gypsum is tilled into the soil, irrigate or allow several inches of rain to fall to leach the Mg from the soil before applying lime. Some farmers are finding out that the soil chemistry stays in balance with very little change over longer periods (10 years or more) when all natural organic fertilizers are used in conjunction with the balancing of soil chemistry. 1.) Mix 1-3 gals. 4-3-3 Natural Fertilizer, 1-2 gals. Natural Liquid Bonemeal, and 1-2 qts. 0-0-8 Natural Kelp and Sulfate of Potash with 50-75 gals. of water. Apply as a fine mist with enough solution to thoroughly cover leaves. Apply first application in spring when plants are 4-6” in height. 2.) Repeat application when crop begins to regrow (4-6” height) after each cutting or grazing (on rotationally grazed pastures). 3.) Apply 2-3 applications per year. Rates vary according to soil fertility, cropping history, and other inputs that are applied. Lower dilution rates are more effective than higher dilution rates. Two or three lighter applications may be more effective than one or two heavier applications. If other constraints allow only one trip over the field, then do not exceed a 3% dilution rate (3 gals. Natural Fertilizer to 100 gals. of water. The addition of a biodegradable surfactant increases uptake by promoting adhesion to the leaf surface. Apply all natural pasture fertilizer in early morning or late evening. Do not apply before or after rainfall or irrigation. On standard field sprayers use turbo flood jet or flood jet nozzles when applying all natural liquid organic pasture fertilizer to reduce clogging and increase atomization. To reduce susceptibility to attack of insects and disease causing organisms, apply 1-2 gals. of 4-3-3 or 1-2 qts. of 0-0-8/acre when signs of infestation begin to become apparent. When all natural liquid pasture fertilizer is added to the spray tank it reduces the pesticide needed to obtain effective control by 1/3 o 1/2. Some growers are finding that natural fertilizer applications alone eliminate the need for pesticide applications when they are applied at the same times as pesticides. Mix 3-6 gals. 4-3-3 Natural Fertilizer with 20-30 gals. of water. Apply solution after seedbed preparation. Drag lightly after application. For more information on All Natural Hay and Pasture Fertilizer (including bulk pricing), fill out the form above or call me at 913-708-1985. "Watched most recent video...these really help by the way. Thanks for all your help. This is the best help I have had from anyone in the fertilizer industry." "The info came today, I just opened the envelope, browsed through the contents, it's looks promising, however my wife has supper almost ready, so I hope later this evening to do some reading! "It was a pleaure talking with you and I look forward to a long business relationship. "Yes, I received it and am reviewing it. I should be placing an order sometime next week.